It’s now almost tradition for me and the boyfriend to home cook steak during Valentines because we don’t really want to have to deal with traffic and crowds. Especially today, since it’s Pay Day Friday as well. Can you just imagine how packed every restaurant is going to be? It just so happened that while we were planning what to do for our Vday date, we chanced upon Meltique beef at Waltermart. I’ve heard about this from my room mate Aileen. It’s not quite Wagyu (and it comes from Australia) but there’s a lot of marbling in the meat so you can actually enjoy good meat for less. This pair of striploin costs about P560. If I ordered something like this from a restaurant, we’d be spending probably 4x as much. I only get flowers once a year and only on Valentines because he usually gets me books or video games. He actually laughed when I identified the flowers here because he didn’t think I’d be the type to know flowers by name. There’s a lone red gerbera somewhere in that stash. I love red gerbera. And carnations. And stargazers. But I usually prefer seeing them alive and still stuck to the ground. 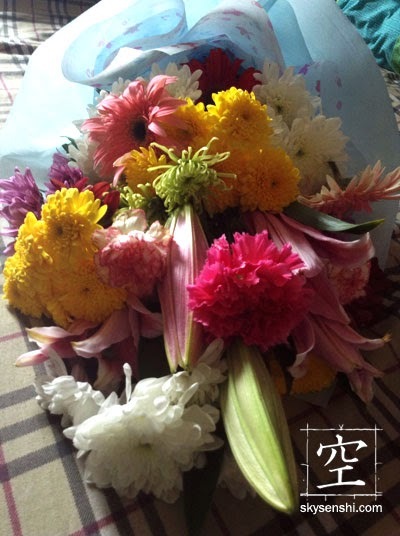 Getting a bouquet is lovely once a year, though. Knowing that the meat we bought is pretty good, I didn’t have to do much except rub the pieces in salt and cracked black pepper and fried it in butter. Because I just had a “raw ground beef scare” a couple of days ago, I deliberately set out to cook a medium (instead of my usual medium-rare) steak. For the side dish, I steamed some broccoli in olive oil and garlic (click link for the recipe). I replaced the red chili pepper flakes with ground black pepper because we’re both not fond of spicy things. Ok, let me just gush at how much I fell in love with Meltique. The boyfie suddenly remembered that he had no steak knives at his condo (and I was too lazy to go back to mine). We used a regular knife and we were surprised at how easy it was to slice through a medium-done steak. And wow! I suspect that if I had done medium-rare, it would have been a melt-in-your-mouth experience. Even at medium, it felt heavenly to chew on. Such a lovely, tender steak! I’m going to try to cook Wagyu next time and see if there’s a huge difference, but for now we are pretty happy with Meltique. Yum! My kids are addicted to Meltique as well. Yeah, I can totally understand! The reason I avoid red meat and only treat myself to steak once in a blue moon is that it's difficult for me to chew now that one of my molars have been taken out. But this is so tender, I don't feel so bad about cooking it medium instead of medium-rare! Be sure to get Meltique from a store that has fresh stock. The one I tried was maanta. It's obvious that the marbling is simulated with added fat, instead of naturally occurring. Ooh thanks for the tip. Yup. I read in their website that they inject the fat, unlike Wagyu, which come from cows that are pampered. Haha. Would like to try Wagyu next time so I'll really have to pay Kitayama meat shop a visit for it. 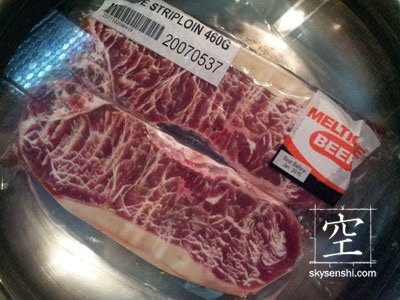 meltique is a “fabricated” meat glue steak. not really bad. think crab sticks or chicken nuggets. fat can sometimes taste funky though.